Dr Mustafa Ahmed is originally from Nottingham, England. His father Dr Ilyas Ahmed came to the UK from Burhanpur in India in the 1970s and over the decades since has become one of the senior most and highly respected physicians in his hometown as well as a dedicated pioneer of the Nottingham Dawoodi Bohra jamaat. For virtually the entire life of the jamaat, around 40 years, Dr Ilyas Ahmed has been the wali mulla and often entrusted with the running of all of its affairs. The medical tradition continues with both of his sons having become practicing doctors and daughter a dentist. 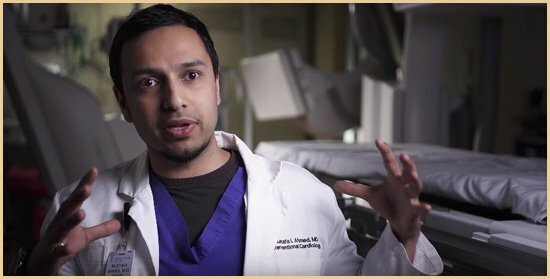 The remarkable work of one of his sons, Dr Mustafa Ahmed, in cardiac surgery is highlighted in the linked article and video. Dr Mustafa was born and brought up in Nottingham from where he eventually arrived in Alabama, USA along with his wife. He soon became a father and the family has held true to the religious roots their parents had painstakingly planted and nurtured. Dr Mustafa was a keen reciter of the Quran in tajweed and had even completed the memorization of 10 chapters prior to his medical career.